Acoustic Privacy Panel Mounting Hardware allows you the freedom to mount your Acoustic Privacy Panel in minutes. Get your hardware in your choice of color to match your UPLIFT Desk. Acoustic Privacy Panel Mounting Hardware lets you rearrange your panels in the future. Why do I need hardware for my Acoustic Privacy Panel? If you want the freedom to add and remove your Acoustic Privacy Panels with ease, our Acoustic Privacy Panel Mounting Hardware is a crucial set to get you working with fewer distractions. Simply connect to your panels with two handy clamp mounts and tighten onto your desk to assemble and you're good to go! Do I get a choice of color for my hardware? Yes, you can match your Acoustic Privacy Panel Mounting Hardware to your UPLIFT Desk in black, white, and gray powder-coated finishes. How many pieces does this come with? This listing comes with two clamp brackets and two support brackets, which is all you need to attach your Privacy Panels to your desk. Choose between black, gray, or white to accent your Acoustic Privacy Panel. By installing your panels using these reusable mounting tools, you'll give them a little extra support, making them more resilient to bumps and motion when you adjust your desk higher and lower. 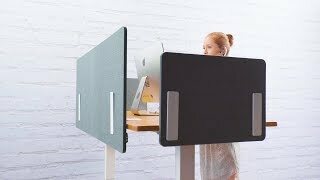 Adding the Acoustic Privacy Panel to your desk using this mounting hardware is a breeze. Just slide the pegs of the support brackets through the holes on the panel. Secure the clamp brackets to the privacy panel using a flat-head screwdriver. Then slide the clamps into place along your desk's edge and tighten the clamps down all the way. Clamps are compatible with desktops up to 1.75" thick.